A brand we created for our handcrafted goat milk soaps & skincare products! ALPINE MADE features raw organic goat milk handcrafts. Visit alpinemade.com to sign-up and stay informed when new products are added and promos offered! In early 2013 we will launch our lotions and creams all made with our raw organic goats' milk. Remember, our soaps and skincare products are crafted using our RAW, ORGANIC GOAT MILK produced on our farm. Grand Opening starts in a few hours. One of our first 30 customers will be the lucky winner of this gift basket! As soon as we gather the entries we will post a video announcing the lucky winner. Thank you to our valued customers. 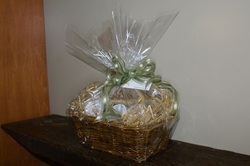 Thank you to all our customers who entered our Grand Opening Promo to win a soap basket. We announced our winner by video on July 31, 2012. Congratulations to our winner and enjoy! Goat Milk Soap: hand crafted with our raw, organic goat milk. Coming soon! 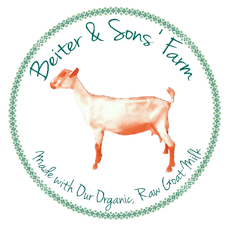 Beiter and Sons' Farm is working on a soap product line that will be made with our 100% certified organic, raw goat milk from our farm. Our soaps are free of artificial fragrances,colors, or preservatives and are handcrafted in the USA. A vegetable base of olive, canola, castor, soy, palm, coconut, and/or jojoba oils, organic goat milk, organic egg, honey, and 100% pure essential oil. They may also contain a natural exfoliate such as colloidal oats, cornmeal, coffee grounds, or flax meal, and botanical extracts or spices added for color. We've been busy here at our farm making soap, tending to our female goats who are having babies as I write, and designing a package, logo, and label to use on our all natural, goat milk soaps. We hope to have a diverse and large inventory by June, 2012. Stay tuned, and thank you. Our certified organic meat goats are pasture raised on our certified pasture. The kid goats are butchered at 4 months old and weigh on average 35 lbs (carcass weight). They are exclusively milk fed early on and continue to receive milk up until processing. By the way, did you know that goat meat is very tender and a low fat, low cholesterol alternative to "red meat." If you order a whole goat from us, it is the most economical way to do so and your goat will be cut and packaged how you want it, which includes sausage at no extra cost. Whole goats are priced @ $8.00/lb. We sell individual cuts also, but pricing varies and is more expensive. Please call Kerry for further information @ 716-430-9928. Our 2012 butcher date is August 3rd, and we are currently taking orders. We are officially certified organic for the following: pasture, milk, and goats. Our dairy goat herd is certified organic as of January, 2012, which means we have organic goat milk now. We are currently entertaining the idea of producing "value added products" (such as goat milk soap) using our certified organic milk. So stay tuned, and thank you. Becoming certified organic was an experience to say the least, but we are so very glad we engaged the process early in our farming progress. Even though organic certification is an added expense especially for emerging farmers, it can be worth the cost in the long run when farms are able to re-coop the cost through price adjustments to their organic products. Not only is the organic brand a healthier choice for consumers, it can potentially bring in a powerful source of income to the family farm, eventually leading to the expansion and diversity of products available to the consumer. Supporting small, organic family farms helps the local economy and ensures continued healthy food production in your community. Thank you to NOFA-NY Certified Organic LLC who has been extremely patient and helpful through the entire process! January of 2011, I submitted an application to have our farm’s pasture, dairy, and poultry operations certified organic. Granted, we are still very small but we intend to grow as time allows, and so we decided to proceed with the certification process and entered the organic transition phase sooner rather than later. We plan to sell organic poultry and live goats for cabrito this summer, 2011. Next spring, we will raise certified organic eggs for the first time. NOFA-NY Certified Organic LLC will be reviewing our application, and certifying inspectors will visit our farm this spring. We are eager to see what happens during the process. The application itself (20 plus pages) was painstakingly tedious. I had to convey everything we have done, we currently do, and we plan to do on paper. If your contemplating applying for organic certification don't be alarmed upon initial review of the requirements. If you keep good records and don’t mind transferring the data you collect onto logs, then you won’t find the experience impossible. Eric and I have always followed the national organic standards when feeding and medicating our animals, so changing over from a “conventional farming system” wasn’t really that hard. The process just required us to be more diligent about writing every detail of farm living down on paper. Eric and I applied for EQIP's Organic Initiative grant program last spring, 2009. Low and behold we ranked high with the program criteria and were awarded a grant for 2010. For those of you not familiar with EQIP it is a program that The US Dept. of Agriculture's Natural Resource Conservation Service oversees to help facilitate conservation of wetlands and highly erodible lands. The EQIP grant we were awarded asks us to implement specified rotational grazing practices on our farm. It also pays us to install high tensile fencing and water pipelines, construct watering facilities operated by pumps, and utilize our livestock waste according to nutrient management guidelines. We are a small farm that sits alongside the Buffalo Creek in South Wales, NY, and I believe that because most of our acreage classifies as a wetland, we were awarded the grant. Thus, being small does not automatically disqualify farmers for government grants, there are opportunities out there to get you started.